View More In Self-Inflating Pads. Ideal for either backpacking trips or family camping, the Black Pine Big Johnson self-inflating air mattress will help keep you warm and comfortable when you're sleeping outdoors. 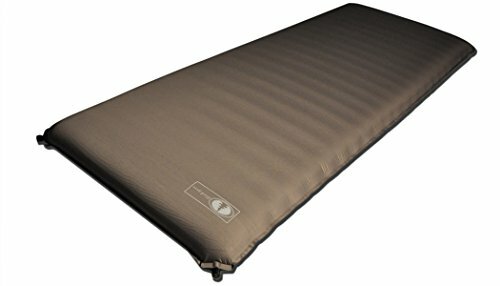 A layer of memory foam provides comfort and insulation to keep you warm unlike any other camping air mat -- whether you're sleeping on the ground or on a cot over cold air -- and the nonslip base means that it won't slide around as you move during the night. Super-speed dual valves make for fast self-inflation and quick pack-up. The mat rolls up easily to slide into its sturdy carrying sack. Generously long and wide, the Big Johnson camping air mattress is still lightweight enough to be a convenient comfort essential for your family camping adventures. The honeycomb ripstop shell has a heavy-duty 50-denier stretch top and 75-denier nonslip back. This package also includes a stuff sack and a repair patch kit to ensure you never have to miss a good night's sleep. The mat measures 78 x 30 x 4 inches, and it weighs 5.3 pounds. Since 1999, Black Pine Sports has been offering the coziest sleeping bags, the best in family camping tents, backpacking gear, self-inflating air mattresses, and more with its Black Pine, The Backside, and Grizzly brands. If you have any questions about this product by Blackpine Sports, contact us by completing and submitting the form below. If you are looking for a specif part number, please include it with your message.